Technology is hard to keep up with – nowhere more so than in the video capture and evaluation of human movement. When I completed my biomechanics thesis in the mid 1980’s this meant filming in high speed – 35 fps or better (TV is about 24 fps) then digitising 16 marker points for each consecutive frame, printing stick figures from each frame, hand measuring each joint angle with a pencil and protractor of each stick figure, then using this data to calculate angular velocities. For a single 10 second exercise it would take nearly 2 days to extract any meaningful data – my study had 8 woodchopping subjects each doing three repetitions – weeks of data analysis. Today this could be done in a day with more accuracy and analysis of more variables. 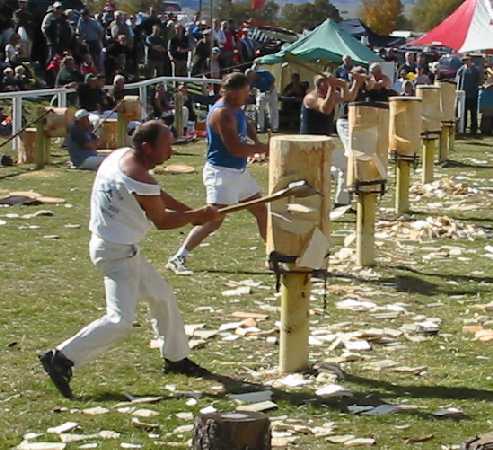 Here is an interesting post on woodchopping. Why is this important? Motion capture gives a researcher, coach, health practitioner or personal trainer a quantitative tool to study “dynamic ergonomics” (physical parameters both in two & three dimensions) and qualitative tool in observing pure motion. This provides insights for understanding the physical limitations of users and/or a therapy/exercise products’ suitability for a task (particularly in the early stage of a product development process rather than the later usability testing stage). For some great research articles on motion capture and analysis in sport and exercise visit the Motion Time Journal. Subscribe for regular updates and abstracts. Motion capture and analysis has been used extensively in sports such as golf and tennis for many years. Here you have applications for teaching/coaching skills, competitor analysis and racquet or club suitability. There have been a number of workshops held internationally that are worthwhile investigation – here is an example from the University of Sussex in 2010. There are also a number of very good short courses on the technology of motion capture – broad ranging as this technology is used primarily for CGI special effects (Movies like Iron Man 2) or video game development. Deakin University in Australia has a very well regarded course. The ready availability of technology for home users that was once the exclusive province of scientists, will mean that more and more innovative applications are developed on a weekly basis. We have seen its applications in Wii Fit and my mind boggles at the future applications of the Microsoft Kinect System – currently a gaming system – but the future? ?